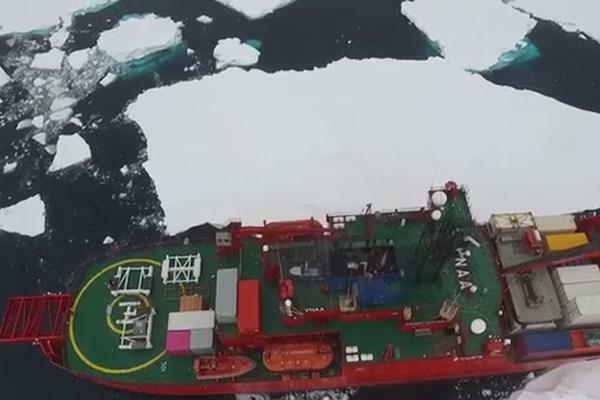 The Australian Government Antarctic Division is utilising quadcopter drone technology on the Aurora Australis to help monitor sea ice conditions. The drone is assisting in the ship’s annual resupply voyage to Casey Station, located in the Windmill Islands outside of the Antarctic Circle. The unmanned aerial vehicle (UAV) is flown off the stem of the ship. It flies for eight minutes at a time to collect the data necessary to help ship navigation. It works to provide the crew with real-time imagery of the conditions of sea ice in the ship’s pathway. The UAV also has satellite imagery and radar capabilities. This helps the Aurora Australis crew to make optimal steering decisions. This is the first instance that the Australian Antarctic Division has used drone technology to assist in its operations, stated Mr. Matt Filipowski, Future Concepts Manager, Australian Antarctic Division. The quadcopter reportedly made five flights during the nine-day voyage upon the Aurora Australis. However, the project did not fail to run into a few technical obstacles before its official use. “Unlike deploying a helicopter from a ship, a drone can be launched in a matter of minutes, costs little to operate and saves valuable cargo space because it only needs a 4m x 4m space from which to be deployed," said Mr. Filipowski in a statement. The drone also could not calibrate it’s compass on the ship and had to adapt to the frigid temperatures of the Antarctic- which the technology was not previously suited for. This required the team to disable the GPS and run in full manual mode in order to operate with success. Drone usage by Australians in Antarctica is regulated by the Civil Aviation Safety Authority (CASA). Their regulations do not permit commercial operators to operate UAV’s without a licence. CASA recently had to adapt to the growing use of UAV with proposals to change laws, to fit the trending technology. The drones upon the Aurora Australis ran the proof-of-concept flights through a CASA certified company. The flights will be reviewing to determine if UAV technology will be used in the future.